Again, no new pictures or videos until my laptop is fixed, but today i'll talk about a topic I get asked out a lot? How Do You Become a Beauty Blogger? A lot of my viewers ask this question wanting to know how I got started and how to get a successful readership. I usually answer the question each time, but I think it’d be more helpful to do a post on it. I always loved makeup. When I was a little girl, I would read through all of the teen magazines like Seventeen, YM, Teen…looking for makeup tips! That’s how I learned the basics. Then when I was a teen, I got invited to my first Mary Kay Makeup party from a lady who went to my church. It was there that I learned the outer V eyeshadow technique which changed my life! From there, I stepped up my makeup game…doing makeup on myself and my friends. I’ve always had a knack for it. It wasn’t until about 3 years ago, that I started getting serious. I was googling one day looking for makeup ideas for New Years. I loved makeup…but everytime I went to the counter, especially at MAC, they would end up doing my makeup like a baby doll. They refused to put on eyeliner except a super thin amount always telling me that it would close up my eyes. I knew that I needed more eyeliner than the average person, or else it would disappear as soon as I blinked an eye. It was when I was searching the internet, that I first came across http://www.asianbeautyblog.com/. This was a forum where a lot of girls who looked just like me showed different makeup looks and did all these amazing looks. That’s where I First me a lot of bloggers...Stephie, Vanessa from Nessasary Makeup, Alien Man, Fei…just to name a few. We started to form a community of Asian Bloggers…this is where I really learned how to do makeup. It wasn’t just my basic outer v technique. I learned about primers, how to make makeup show up, what tools to use…all these great things that you wouldn’t know about. It was the beginning of an addiction! Every night for months, I would be in my bathroom mirror after work, trying to recreate a look I saw. There were many nights where my eyelid skin was raw from removing and reapplying makeup. But the practice really paid off! My makeup techniques were expanding and really transforming. I knew I had some kind of makeup skills and decide to finally step up to the plate. Starting a blog is so simple…sites like www.blogger.com are free and have easy to use templates. 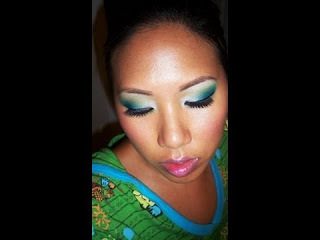 I armed myself with a digital camera and started documenting the looks I created. In the beginning, I think I had all of 2 viewers, lol. However, I stayed consistent…kept on practicing, kept on posting. Over time, the posts began to get easier. I got in the habit of taking pictures of my makeup, writing down what I used. Over time, my posts began to diversify…I started doing product reviews, as my confidence grew even videos. Make videos…my YouTube videos brought in a lot of blog viewers…just remember to mention your blog on your videos. Videos also add another dimension to your blog. Sign up for beauty blog networks...this will again get you exposed to a lot of other bloggers and audiences...it will help promote your blog as well. I'm part of the Total Beauty network which has given me the ability to review products from larger cosmetic companies as well as generate revenue from ad space. Stay professional…by maintaining a professional blog, it’s helped my business as a makeup artist grow and has attracted sponsor companies. Please note, if you have a personal blog, it's fine to be yourself and share your own personal experiences. However, if you choose to do a specific blog, like a beauty blog, it helps to keep things a bit more professional. This will help you network and make contacts in the industry. FTC Disclosures: make sure to include this on your posts where you review or endorse any products. This is the story of how i became a beauty blogger. Of course, everyone has their own journey and tips and tricks. I hope you all can benefit from some of my experiences. Please feel free to leave your own advice in the comments. This was just the beginning for me…want to learn how I became a makeup artist? Stay tuned for tomorrow’s post. Hope your computer gets fixed soon, missing your videos!! Could you remember us wich your youtube channel url, please? LOL! abb was such a long time ago, before it turned into a train wreck! you've come a long way! I just wanted to say that I found this post to be so helpful. You wrote this at the perfect time! I just started a blog and have been doing all of the things that you suggested. However; I was becoming a little discouraged at my lack of readers. But, you have motivated me to keep at it! Thanks so much!! Thanks for sharing some blogging tips and hopefully I'll utilize some of the tips that were mentioned on your post. very informative. thanks so much for sharing! :O) love your YT vids. Great tips - I always enjoy coming by your blog! much needed information. Love it! Thank you so much for sharing your knowledge with us! I am currently out of work, and blogging has become a very big part of my life! I have met some really cool people on Blogger, and love chit chatting with others who are as obsessed as I am about make-up! I love your blog! I can't say it enough. Thank you for the informative posts all of the time they help so much. Thanks sooo much for posting this. This is helpful for me on so many different levels. I'm sooo amazed by your talent, drive, and creativity. Again, Thanks! this is great. i've always been told that i should start a blog and stuff, but i've always thought, "who the heck is gonna read MY stuff?!" So, i've finally done it and this post has gotten my hopes up cause everyone's gotta start somewhere! Thanks so much for posting this!!!!!!!! Your blog is GREAT! This blog contains really good information.I would like to read it again. I seriously love this its inspirational! I've always loved makeup and fashion and stuff like that but didn't start practicing until about 2 - 3 months ago! I'm a perfectionist so i keep practicing... i don't like not achieving what i've set out to do! haha stubborn I know! But I loves this post! ;-) Thank you! Like everyone else, i'd just like to thank you for posting this. It is always helpful to hear from people who've gone ahead and done what you're just setting out to do. I got a good post and tips here! Such an inspirational post! Read this at just the right time, I just started a beauty blog. Thanks for this! Thanks for the tips Ren! I am starting my own beauty blog and struggling a bit!!! This post haped enourmously thanks!I have just recently started writing a blog and was struggling a little, and this is just what i needed. I just started beauty blogging about 2 months ago and i love it! i've already formed a few relationships with other incredible bloggers, but I can certainly use some more advice! Thanks for all of these tips!!! www.deravera.com Using an under eye treatment product, like Deravera, will help to minimize the appearance of dark circles under eyes, puffiness around the eyes safely and effectively by using ingredients that have been clinically proven to work. http://deravera.com is a complete under eye treatment. Visit www.deravera.com and see More why Deravera will work best for you. I love reading your blog. It has helped me a lot in pursuing my dream to be a makeup artist and now a beauty blogger as well. this post is timely since I just started blogging about a month ago. keep up the good work! Thanks for sharing! I have just started blogging, and I hope to share my love for makeup and skincare with others. thanks! this was really helpful. hopefully, my blog will achieve some success. Thank you for posting! I just started my blog a few days ago and I have no idea what I'm doing! haha!